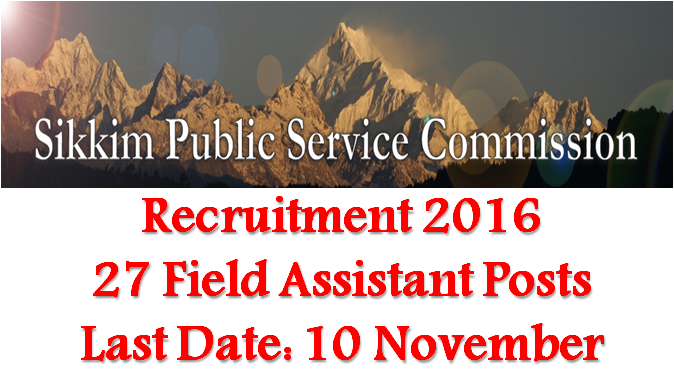 Sikkim Public Service Commission (SPSC) invited applications for recruitment to 27 Field Assistant posts. The candidates eligible for the post can apply through prescribed format on or before 10 November 2016. Sikkim PSC Job Notification: Sikkim Public Service Commission (SPSC) invited applications for recruitment to 27 Field Assistant posts. The candidates eligible for the post can apply through prescribed format on or before 10 November 2016. Educational Qualification for Field Assistant Post: Class XII passed from a recognized board with Mathematics or Economics or Statistics as one of the subject.